Porcupine Tree is a rock band formed by Steven Wilson in 1987 in Hemel Hempstead , Hertfordshire , England . Frequently associated with both psychedelic rock and progressive rock, their music has also been influenced by trance, krautrock and ambient due to Steven Wilson and Richard Barbieri's liking for the Kosmische Musik scene of the early '70s, led by bands such as Tangerine Dream, Neu! and Can. Since the early 2000s, their music has been leaning towards progressive metal. The band are noted for their multimedia approach, with their live performances including screens displaying a different film projection to each song. This visual element was introduced during the tour for the In Absentia album, when the band started to work with Danish photographer and filmmaker Lasse Hoile, whose involvement has created a distinctive image for the band. Despite being signed to both Roadrunner and Atlantic labels, the band have their own record label, Transmission, which they use to launch some independent releases and special editions of their albums. Their 2007 album Fear of a Blank Planet was nominated for a Grammy Award for Best Surround Sound Album. Porcupine Tree originated in 1987 as something of a collaborative hoax between Steven Wilson and Malcolm Stocks. Partially inspired by psychedelic/progressive bands of the seventies, in the likes of Pink Floyd, that dominated the music scene during their youth, the two decided to form a fictional legendary rock band named The Porcupine Tree. The two fabricated details such as band members, album titles, and a back-story, that purportedly included events such as a meeting at a '70s rock festival and several trips in and out of prison. As soon as he put aside enough money to buy his own studio equipment, Wilson obliged the creation with several hours of music to provide "evidence" of its existence. 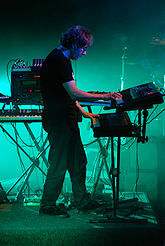 Although Porcupine Tree started largely as a joke and Wilson was preoccupied with his other project, No-Man (an endeavour with UK based singer and songwriter Tim Bowness), by 1989 he began to consider some of the Porcupine Tree music as potentially marketable. Wilson created an 80-minute-long cassette titled Tarquin's Seaweed Farm under the name of Porcupine Tree. Still showing the spirit of his joke, Wilson included an 8-page inlay containing information about fictitious band members such as Sir Tarquin Underspoon and Timothy Tadpole-Jones. Wilson sent out copies of Tarquin's Seaweed Farm to several people he felt would be interested in the recordings. The underground UK magazine Freakbeat was going through the process of starting their own record company when they received the cassette. The tape received mild reviews, but Porcupine Tree was soon asked to contribute to a compilation of up-and-coming underground psychedelic artists. This process was slow, taking eighteen months before completion. During this period, Wilson continued to work on new material, and in 1990 he released The Love, Death & Mussolini E.P., issued in a very limited run of 10 copies. The EP remains an extremely rare, collectible piece. It was composed of nine at-the-time-unreleased tracks, as a preview for the upcoming second album. The EP was followed, over the same year, by The Nostalgia Factory, an album that grew Porcupine Tree's underground fanbase, though the band still carried on the charade of being '70s rock legends. The newly formed Freakbeat magazine editor's record label Delerium, agreed to reissue the cassettes Tarquin's Seaweed Farm and The Nostalgia Factory. A compilation album was also released, as planned, under the title of A Psychedelic Psauna, featuring the Porcupine Tree track "Linton Samuel Dawson". Wilson was invited shortly thereafter to sign with Delerium as one of the label's founder artists. He was originally invited to publish a double album of his two cassettes, but he decided to put instead what he discerned as the best of both tapes onto a single album. The album was released in mid 1991 as On the Sunday of Life.... The rest of the music from the initial tapes was released on the limited edition, compilation album Yellow Hedgerow Dreamscape. In 1992, Delerium released On the Sunday of Life... as an edition of 1,000 copies, complete with a deluxe gatefold sleeve. The album sold out shortly after it shipped, but pressure from public and press alike ensured that it was reproduced, along with a CD version. The album featured future concert favourite and frequent encore song "Radioactive Toy". By 2000, On the Sunday of Life... had racked up sales of more than 20,000 copies. In the midst of Porcupine Tree's rising success, Wilson's other band, No-Man, had been getting excellent UK press (singles of the week in Melody Maker and Sounds), which led to the band being signed to One Little Indian Records, Hit & Run publishing in the UK and Epic 440/Sony in the US. No-Man's success gave Wilson the opportunity to leave his regular job and devote his time solely to music. Looking forward from the original Porcupine Tree music, Wilson took steps to move his project towards newer, more contemporary kinds of music. This new goal scored the band with their thirty minute long single, "Voyage 34". Released in 1992, the song mixed together the ambient trance music of earlier groups like The Orb and Future Sound of London. The single featured what is described as "liquid rock" guitar solos coupled with a narrative from a sixties LSD propaganda LP. The track was too long to make it a radio hit, but it got good response from the underground music scene of the nineties, reaching the UK independent Top 20 singles list. "Voyage 34" was actually a track recorded for another prospective Porcupine Tree double album Up the Downstair. However, when the album eventually emerged in mid-1993 the decision not to include the single had slimmed down the album to a single record. Up the Downstair was greeted with rapture, Melody Maker describing it as "a psychedelic masterpiece... one of the albums of the year." The album continued the fusion of dance and rock and also featured guest appearances from two future full-time Porcupine Tree members, Richard Barbieri (ex-80s art rock band Japan) and Colin Edwin. In November 1993, Voyage 34 was reissued alongside an additional 12 inch remix by Astralasia. With non-existent radio play it still managed to enter the NME indie chart for six weeks and became an underground chill-out classic. The profile of Porcupine Tree had now grown to the extent that the question of live performances could no longer be ignored. Thus, in December 1993, Porcupine Tree became a live unit featuring Steven Wilson on lead vocals/guitar, Colin Edwin on bass guitar, Chris Maitland on drums and Richard Barbieri on keyboards. All three new members of the group had worked with Steven on various projects over the preceding years (Richard Barbieri and Chris Maitland had been part of No-Man's touring band) and all were excellent musicians sympathetic to the sound and direction of Porcupine Tree. The new line up had immediate chemistry as illustrated by the Spiral Circus album (issued on vinyl in 1997) which contained recordings from their first ever 3 performances, including a BBC Radio One session for Mark Radcliffe, an early champion of the group. The next album would not emerge until early 1995, but was preceded by the classic Moonloop EP, the last two tracks to be recorded during the album sessions and the first to feature the new band. Released in 1995, the band's third studio album, The Sky Moves Sideways became a success among progressive rock fans, and Porcupine Tree were hailed as the Pink Floyd of the nineties. Wilson would later lament this, stating "I can't help that. It's true that during the period of The Sky Moves Sideways, I had done a little too much of it in the sense of satisfying, in a way, the fans of Pink Floyd who were listening to us because that group doesn't make albums any more. Moreover, I regret it.". The Sky Moves Sideways was an expansive soundscape of melody and ambient rock experimentation, but would prove to be a transitional work with half recorded before the formation of the band and half recorded after. Most of the album was taken up with the 35-minute title track, which at one point Steven had intended to be long enough to occupy the whole album (an alternate version of the track, containing some of the excised music, was included on the 2004 remastered version of the album). It also entered the NME, Melody Maker and Music Week charts. Together with the Moonloop EP, this album became the first Porcupine Tree music to be issued in America in the autumn of 1995, and attracted favourable press on both sides of the Atlantic . The band supported the album with numerous gigs throughout the year at major venue in the UK, The Netherlands , Italy , and Greece . Partly unsatisfied with the half band/half solo nature of The Sky Moves Sideways, Porcupine Tree promptly got down to the task of recording the first proper band record. Wilson admitted he was always "in love with the idea of the rock band" because "bands have a kind of glamour, and appeal, and a romance about them the solo projects just don't have." The band worked sporadically over the next year on developing a tighter and more ambitious rock sound. After the release of the first real Porcupine Tree single "Waiting", which entered all UK indie charts and the UK National chart attracting airplay all over Europe, Signify finally saw the light in September 1996. The album was a mixture of instrumental tracks and more song-oriented tunes, blending together numerous rock and avant-garde styles, while absorbing many diverse influences but relying on none and still providing a mixture of dreamy melodies and raw power or dark moods. The musicians received writing credits for some tracks, most notably for "Intermediate Jesus," which evolved from a jam session (parts of which would be released on the limited edition double 10 inch LP, Metanoia, at the end of 1998). Steven Wilson at the Strawberry Fair, Cambridge, 1997. A large amount of major European media interest accompanied the album's release, as Porcupine Tree had now become a highly respected force in the musical underground. Wilson: "For me, tracks like 'Every Home Is Wired' and 'Dark Matter' totally transcend both genre and comparison. Finally, I think we are making a completely original and '90s form of music, but which still has its root in progressive music." Meanwhile the fanbase of the band kept on growing, especially in Italy where airplay on a popular radio show had turned the band into a teenagers' favourite, a remarkable crowd compared to the more progressive rock oriented listeners elsewhere. In March 1997, they played three nights in Rome to an audience that surpassed 5,000 people. All three dates were recorded for use in the 1997 live album Coma Divine - Recorded Live in Rome that was released as a goodbye to Delerium Records, which felt it could no longer offer the kind of resources the band needed in order to continue to build its profile worldwide. In late 1997 the band's first three albums were remastered and reissued. Signify also saw a release in the US on Miles Copeland's Ark 21 label. Wilson, Barbieri, Edwin, and Maitland spent all of 1998 recording their fifth studio album, a release that reflected the band's move towards a more song-oriented writing. Wilson acknowledged this time he was "much more interested in songwriting as an art form, as opposed to soundscape development" and commented he took influence from The Beach Boys' Pet Sounds, Todd Rundgren, Crosby, Stills, Nash & Young and "anything with really good ensemble singing". He also indicated that he was "interested in the idea of the pop song as a kind of experimental symphony." At the time of recording, the band had no record deal, but later that year they signed to the Snapper/K-Scope label and in March 1999, the new album, Stupid Dream, was issued. The album was supported by a lengthy tour of the UK, Italy, Greece, the Netherlands, Belgium, Switzerland, Germany, France, Poland, and the USA. The three singles taken from the album, "Piano Lessons", "Stranger by the Minute" and "Pure Narcotic," all achieved mainstream exposure in the US and in Europe and appeared well placed in the UK independent charts and on radio station playlists. In addition, Snapper released the opener song, "Even Less," as a one-track cassette in a plain white sleeve with the words "Who Is This?" written in ink, a number 1 in the top right hand corner and no catalogue number, and delivered it to record stores and radio stations only. Although initially the album was such a departure that some older fans were unsure, it brought the band many new fans and went on to become the band's best-selling and most acclaimed release up to that time. The time spent looking for a record deal had not been wasted, and only a few months after the release of Stupid Dream the band were ready to begin working on a followup. Completed for February 2000, with string arrangements provided by Dave Gregory of XTC, Porcupine Tree's sixth studio album Lightbulb Sun built on the mix of songwriting, soundscaping, and rock dynamics of Stupid Dream. It was released in May 2000, preceded by the single "Four Chords That Made a Million". A sold out show at the Scala in London began a short run of UK shows, to be followed later in the year by European festival dates and a major tour supporting Dream Theater. The band continued touring through the end of 2000 and start of 2001, including their first major tour of Germany. A special double CD edition of the Lightbulb Sun album was issued in Israel and Germany, and in May, Recordings, a limited edition collection of EP tracks and out-takes from the previous two albums, was released as the band's final release under their Snapper/K-Scope contract. In May 2001 they did three consecutive dates as a support band to Marillion, in France, Germany and The Netherlands respectively. In June the band played a short US tour, starting with an appearance in the famous NEARfest of Pennsylvania to culminate in a sold out show at the Bottom Line in New York City . Shortly afterwards Porcupine Tree announced that they had signed a new international record deal with Lava/Atlantic Records. In February 2002 Porcupine Tree's first line-up change occurred when drummer Chris Maitland departed after eight years with the band. The band welcomed drummer and longtime acquaintance Gavin Harrison to the line-up. In March 2002 a box set of the band's early work was released, entitled Stars Die: The Delerium Years 1991-1997 and the band commenced recording their first major label album, drawing from a pool of 30 new songs written by Steven in the previous two years. Recording sessions took place at Avatar Studios in New York and London, with veteran engineer Paul Northfield and string arranger Dave Gregory also playing major roles in the making of the record. Mixing of the new album was completed in Los Angeles in May with Tim Palmer. The eagerly awaited new album, In Absentia, was released by Lava Records in September 2002 (European release January 2003). The album received great praise worldwide and went on to become the band's best selling album, shifting over 100,000 copies in its first year of release and charting in several European countries. The band also released a 5.1 surround sound version of the album, mixed by Grammy Award winning producer Elliot Scheiner. The surround sound version of the album won the award for best 5.1 mix at the 2004 Surround Sound Music awards in Los Angeles. To promote the album the band undertook four tours of Europe and North America, including one with acclaimed Swedish metal band Opeth. On tour the new line up of the band was further augmented by additional touring vocalist/guitarist John Wesley. During these tours the visual element of the band's performance was taken to new heights with the involvement of filmmaker and photographer Lasse Hoile, who had created the cover art for In Absentia and now went on to create a dark and surreal visual counterpoint to Porcupine Tree's music. The long promotional campaign for In Absentia ended on 30 November 2003, as the band played a homecoming show to a sold out London Astoria . During 2003 Porcupine Tree set up their own label, Transmission, with an online store hosted by Burning Shed record label. The first release on the Transmission label was a studio session recorded for XM Radio, Washington , followed in 2004 by a recording from Polish radio in 2001. The band plan to use the label to issue a series of well recorded and packaged live and exclusive studio recordings. 2003 also saw the start of a lengthy reissue/remaster campaign, with many of the early albums expanded to double CDs. These reissues included re-recorded/remixed double CD versions of the Up the Downstair, The Sky Moves Sideways and Signify albums, and the reissue of Stupid Dream and Lightbulb Sun, both comprising a CD with a new stereo mix of the album plus a DVD-Audio with a 5.1 surround mix. In early 2004 the band embarked on the recording sessions for an ambitious new record, Deadwing, their second for Lava/Atlantic. The album takes its inspiration from a film script written by Steven with his filmmaker friend Mike Bennion. With the album sessions completed in November 2004, and the band's total worldwide sales now approaching half a million units, demand for new music from the band was at an all time high, and increasing media coverage, word of mouth and fan-power continued to create interest in Porcupine Tree throughout the world. Deadwing was released in Europe and the US during the spring of 2005 as both a stereo and 5.1 surround sound album, preceded by the release of two singles, "Shallow" in the US, and "Lazarus" in Europe. The album benefited from guest appearances by Adrian Belew from King Crimson and Opeth's Mikael Åkerfeldt and was a commercial success, due in part to "Shallow" receiving airplay, peaking at #26 in the Billboard's Hot Mainstream Rock Tracks . "Lazarus" entered the Germany singles Top 100 at #91. The tour to promote the album commenced in the UK at the end of March, and continued throughout the year. The song "Shallow" would later be featured in the soundtrack for the film Four Brothers. Later on, Mike Bennion created a MySpace page dedicated to the prospective Deadwing film, in which he posted the first fifteen pages of the script and included a trailer. However, while the scripts are finished, the project is still on hiatus due to lack of budget. The album won the Surround Music Awards for "Best Made-For-Surround Title" the same year of its release, and was voted number 2 album of 2005 in Sound & Vision, which is the most widely distributed US magazine in the field of home electronics and entertainment. The White Stripes's Get Behind Me Satan was the number one album. Porcupine Tree released Deadwing in Japan on 22 March 2006, making it the first album by the band to be released in that country. The band's website also announced that new material would be played during the first half of their tours of Europe and the United States. Their new material was much heavier and layered than anything they had previously done, indicating that Porcupine Tree was heading towards an even more metal oriented sound. On 8 August 2006, it was announced that Porcupine Tree had signed with Roadrunner Records UK. Wilson commented that "Roadrunner has established itself as one of the world's premier independent labels for rock music, and we couldn't be more enthusiastic about working with them to expand our audience and elevate Porcupine Tree to the next level." The first Porcupine Tree concert DVD, Arriving Somewhere..., was released on 10 October 2006. It was accompanied by a brief tour in which the group performed 50 minutes of new material for the forthcoming studio album for the first half of the shows. Supporting acts included Swedish band Paatos in Europe (except France and Belgium where they were supported by Oceansize), and ProjeKCt 6 (Robert Fripp and Adrian Belew) in the USA . In January, 2007, it was revealed the title for the forthcoming album would be Fear of a Blank Planet. With the release of Fear of a Blank Planet on 16 April 2007, Porcupine Tree charted in almost all European countries and peaking at #59 on the Billboard 200. A tour of 92 dates for 2007, took the band to countries they had never visited, like Finland and Mexico . The tour also included appearances in many major music festivals such as the German twin-festivals, Hurricane and Southside , and the Download Festival of Donington Park . Later in 2008 when the tour resumed, the band performed their first ever shows in Australia. The lyrics of the album deal with common behaviour tendencies concerning society (especially youth) in the beginning of the 21st century such as bipolar disorder, attention deficit disorder, drug abuse, alienation and depravation caused by mass media. Wilson: "My fear is that the current generation of kids who're being born into this information revolution, growing up with the Internet, cell phones, iPods, this download culture, 'American Idol,' reality TV, prescription drugs, PlayStations — all of these things kind of distract people from what's important about life, which is to develop a sense of curiosity about what's out there." The concept of the album was inspired mainly by Bret Easton Ellis novel Lunar Park and the title alludes to Public Enemy's album, Fear of a Black Planet, both sharing the particularity of reflecting notorious conflicts affecting society in the world at some time. Wilson notes that while race relationship was the main issue among young people when Public Enemy's album was released, in the 21st century it was replaced by a general superficiality, boredom, and introversion. The album features contributions from Rush's Alex Lifeson and King Crimson's Robert Fripp. A new EP called Nil Recurring was released on 17 September 2007, featuring four unreleased tracks from the Fear of a Blank Planet sessions and including another contribution from Robert Fripp. The second leg of the tour started on 3 October 2007, now promoting new music from the EP. Nil Recurring entered the UK Top 30 Independent Label Albums at #8. The EP was later reissued in 18 February 2008 through Peaceville Records. On 5 November 2007, Fear of a Blank Planet won the "Album of the Year" award for the 2007 Classic Rock magazine awards. In December, 2007, it was nominated for a "Best Surround Sound Album" Grammy though Love by The Beatles won the award. In January, 2008, was voted "Best Album of 2007" by readers of the Dutch Progressive Rock Page. The LP version of Fear of a Blank Planet includes the Nil Recurring EP tracks. A recording from an 4 October 2007 in-store, mostly acoustic, performance at Park Avenue CDs in Orlando (Florida ) was released on 18 February 2008 on CD under the name of We Lost The Skyline. The title is a reference to the lyrics of "The Sky Moves Sideways ," which was the opening song on the live set. The album was released on vinyl of 21 March 2008. It was originally intended to be a full-band show, but lack of space in the store determined that only the two guitarists, Steven Wilson and John Wesley, played. According to Porcupine Tree's manager, Andy Leff, the band planned to release a live album in September, 2008. Wilson commented that the album will be issued through Roadrunner Records. However, the live record is currently put on hold without a known future. This was confirmed by Gavin Harrison on the Drummerworld forum's post #2540 of Gavin's thread. The band played a short European tour in October 2008 in order to shoot their second live DVD. The filming took place on 15 and 16 October, 2008 in the Netherlands at the 013 Tilburg venue. In this leg of the tour the band played for the first time as headliners in Portugal . During one of these shows, Wilson mentioned that Porcupine Tree had started work on material for their next album, with an eye toward a release in 2009. The band started recording their tenth studio album - The Incident - in February 2009. This was confirmed by the band, posting this message on their official website: "Writing for the next PT studio record is well underway, with the band recently spending two weeks scheduled in the English countryside working on new tracks. Recording of these pieces and a new 35 minute SW song cycle were due to start in February..." A tour was announced on the band's website and MySpace, along with dates, following release of the new album. Around March and April, Wilson commented the 35 minute song kept evolving and now it has become a 55 minute song, occupying the entire disc. On 12 June 2009, details were revealed on the Porcupine Tree website: "the record is set to be released via Roadrunner Records worldwide on 21st September, as a double CD. The centre-piece is the title track, which takes up the whole of the first disc. The 55-minute work is described as a slightly surreal song cycle about beginnings and endings and the sense that ‘after this, things will never be the same again.’ The self-produced album is completed by four standalone compositions that developed out of band writing sessions last December - Flicker, Bonnie The Cat, Black Dahlia, and Remember Me Lover feature on a separate EP length disc to stress their independence from the song cycle." As a teenager, Wilson was a fan of the New Wave of British Heavy Metal. From this starting point, his interest in music progressed on a cyclic path. When he discovered Seventies music and progressive rock, his interest in metal diminished in favour of experimental music. He later (in the 2000s) discovered bands like Gojira, Mastodon, Neurosis and Meshuggah, which restored his faith in metal music. "For a long time I couldn't find where all these creative musicians were going…", said Wilson, "and I found them, they were working in extreme metal." Shortly thereafter he went to produce three consecutive albums by Swedish progressive death metal band Opeth and this had a considerable influence in his further songwriting. This shift in influence explains why the musical range of Porcupine Tree can be split into three phases, namely from long psychedelic and space rock pieces in early works, to shorter pop rock songs in late nineties, and darker more metal-oriented songs in the beginning of the 21st century. There is also some noticeable influence from krautrock and electronic music since Wilson likes bands such as Can, Neu!, Tangerine Dream, Squarepusher, Aphex Twin and artists like Klaus Schulze and Conrad Schnitzler among others. Wilson has also mentioned on multiple occasions that he also admires the work of American musician Trent Reznor. The music of Porcupine Tree is often described as melancholic by many people, even though it is not necessarily linked to Steven Wilson's personality. He states music is a way for him to channel all his negative feelings, and "an exorcism of those elements within", finding it "easier to write songs about the negative side of the world than it is about the happy side of the world." In the Warszawa live radio broadcast album, before performing "Stop Swimming", Wilson can be heard saying "the saddest music is often the most beautiful." "The important thing with Porcupine Tree is that all our songs have a unique sound world that they inhabit. I don't like the idea of any song sounding like any other song. So most of the time it's a case of finding the sound world first whether it be a texture or a drum rhythm that sets you off on a certain musical path, or particular musical atmosphere, or flavor." For their recordings the band has included mellotron, banjo, hammered dulcimer and guimbri among other instruments unusual for rock bands. Above all, Porcupine Tree music has maintained a strong textural and experimental quality, often fusing many genres in a single track. The band's work is noted for its atmospheric nature (strongly helped by Barbieri's keyboard style and sound-processing abilities) and cinematic scope (Wilson is a declared fan of American filmmaker David Lynch, whose films are renowned for their sonic content). "Very layered, very produced, very arranged and [with] complex arrangements" is the way Wilson describes the sound of the band. Apart from their regular edition, the albums Stupid Dream, Lightbulb Sun, In Absentia, Deadwing and Fear of a Blank Planet are available in DTS (5.1 Surround Sound) mix; this mixing technique has become a tradition for the band in recent years. Porcupine Tree are often categorised as a progressive rock band. Although many listeners familiar with the group label them as such, Steven Wilson has been noted in the past to express a certain dislike for the use of the term "progressive" to refer them. However, in a more recent interview with Prog Archives.com, he made note that he has since become more relaxed towards the word considering it is becoming "a much broader term" as time passes. He has frequently stated that he dislikes the press comparing Porcupine Tree with neo prog bands or citing them as 'the New Pink Floyd.' "For me that is so insulting", commented Wilson in an interview with The Dutch Progressive Rock Page, "because it insinuates that you are living in the shadow of some other band. I particularly never wanted to be the new anybody, I just wanted to be the old Porcupine Tree, or the new Porcupine Tree." Voyage 35 fanzine, issue #10, p. 6, February 1999.